Double-checking permalink settings and uninstall of test plugin. edit humm and no smilily either..??? i can’t make it out its so tiny! Responding to widespread criticism that its temperature station readings were corrupted by poor citing issues and suspect adjustments, NOAA established a network of 114 pristinely cited temperature stations spread out fairly uniformly throughout the United States. Because the network, known as the U.S. Climate Reference Network (USCRN), is so uniformly and pristinely situated, the temperature data require no adjustments to provide an accurate nationwide temperature record. 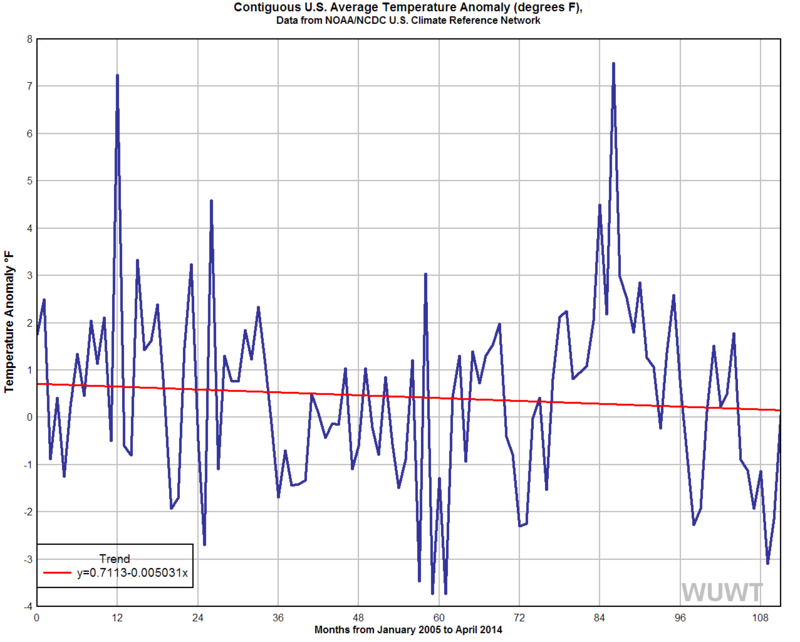 USCRN began compiling temperature data in January 2005. Now, nearly a decade later, NOAA has finally made the USCRN temperature readings available. First, global warming is not so dramatic and uniform and alarmists claim. For example, prominent alarmist James Hansen claimed in 2010, “Global warming on decadal time scales is continuing without letup … effectively illustrat[ing] the monotonic and substantial warming that is occurring on decadal time scales.” The word monotonic means, according to Merriam-Webster Online, “having the property either of never increasing or of never decreasing as the values of the independent variable or the subscripts of the terms increase.” Well, either temperatures are decreasing by 0.4 degrees Celsius every decade or they are not monotonic. Third, the USCRN data debunk claims that rising U.S. temperatures caused wildfires, droughts, or other extreme weather events during the past year. The objective data show droughts, wildfires, and other extreme weather eventshave become less frequent and severe in recent decades as our planet modestly warms. But even ignoring such objective data, it is difficult to claim global warming is causing recent U.S. droughts and wildfires when U.S. temperatures are a full 0.4 degrees Celsius colder than they were in 2005. Of course, to global warming alarmists, all real-world data are irrelevant.